Back in January, in collaboration with Chase Zander, I started a process of consulting with senior IT managers to develop a list of the top business issues that they faced. This exercise was intended to shape the content of a IT Director Forum that we were planning. This will now be happening on 26th March in Birmingham (for further information see this post). Back then, I promised to share some of the findings from this study. These are summarised in the above diagram. The input was based on public comments made by a selection of senior people on the CIO group of LinkedIn.com, plus e-mails sent to me on the topic and feedback received by Chase Zander. 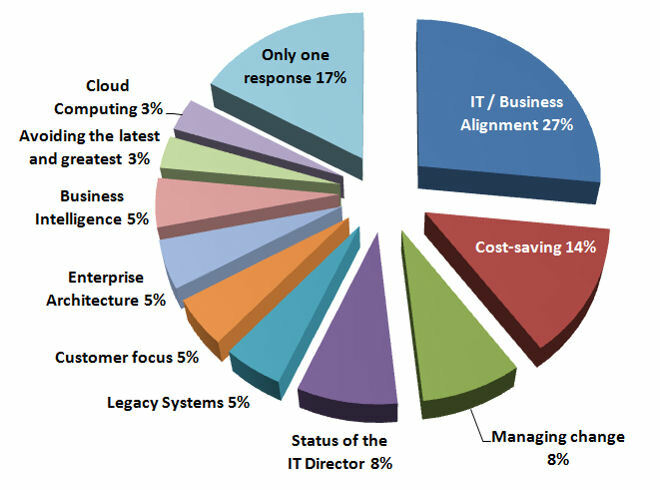 I would like to thank all of the IT professionals who contributed to this survey. This really aligns with what my clients have said to me in the past, especially with regard to IT/Business Alignment. I have been told how they are drowning in data but, since their top level key performance indicators are not aligned with operations, they don’t have enough information. Thanks for your comment Kevin. Your results are spot on! We have seen so many organizations not understand the importance of proper alignment of not only their IT but the business itself. A friend of mine, Stan Kirkwood (who, by the way, is the former CIO for La-Z-Boy), put together a presentation out on Slideshare called, “Trying to Align IT to the Business Is Futile” (http://www.slideshare.net/stankirkwood/dont-try-to-align-it-and-the-business-presentation). The title itself gets the attention of many, but the lesson is It can’t be looked at as a separate part of the enterprise, it has to be viewed as integrated into the “whole”. That’s the only way the CIO/IT Department will ever get the respect they so crave! Thanks for the very interesting survey results! Thanks for the comments and the link – I’ll take a look at the presentation tomorrow. On the topic of alignment, you might want to check out my collection of articles on the subject here. No I didn’t try to capture that information. I think part of the problem has to do with how people think and the words we use. For instance we talk about the Government as if it was a single entity. The same is true for Wall Street and Main Street. But those are not single entities. Wall Street is made up of many good people – people who worked hard and played the game the way it was explained to them. The same can be said about Main Street (where I live), the Government and the business. Aligning IT with the business makes a false assumption – that there is one thing to align to. “The Business” does not exist as an entity. It is comprised of many parts and most of those parts are going in different directions. I have learned through the years that ‘the business’ is not aligned with ‘the business’ – that should be the number one issue for CEOs. Alignment is not an IT issue, it is a business issue, and can only be achieved by designing all of the parts of a business to work together. Thanks for your thoughts on this. I’m just back from helping to run a seminar at which this was a major talking point and I will try to write a piece about it soon. I took a brief look at your paper, but if you want to start a discussion about it, maybe posting something more substantial that “Please be aware […]” would be a good start. Before you start a new business, be sure the community can support such a business. Being aware of challenges and issues is important for any successful CIO’s management strategy. Always keep in mind that willingness to share information and adopt best practices across the organization locally and globally.